The final story in the volume of novellas by Irene Nemirovsky – a book that’s been much absorbing me in recent weeks – is a little different to the other ones I’ve read. “The Courilof Affair” ventures into territory that’s dissimilar to her other works, telling a story of Russian revolutionaries; in particular one Leon M, who we meet initially in the South of France where he’s living out his last days in post-WW1, post-Russian revolution Europe. Leon encounters a man who recognises him from the past, and this sets of a train of recollection whereby he writes down the story of the Courilof Affair – an event in which he was pivotal and because of which the stranger recognised him. Our narrator grew up as the son of a pair of revolutionaries and it was inevitable he would follow in their footsteps. After they died he was brought up in Geneva and when fully grown, it was here that he was given his task – to assassinate the Minister for Schools, Valerian Courilof. Posing as a Swiss doctor, Leon worms his way into the family and confidence of Courilof, preparing all the time for his revolutionary act. However, Leon finds that things are not as black and white as he had been brought up to think, and that the assassination may not be as simple as it seems. “The Courilof Affair” was a fascinating novella, exploring the nature of terror and the need for revolutionaries to kill; in fact, it’s a remarkably prescient work, showing that the terrorists don’t simply want to kill the target concerned, but want to make a spectacular statement, a kind of dramatic gesture. Leon finds himself questioning this aspect of his chosen path, as he could have easily murdered his target discreetly at any point while acting as his medic. But the revolutionaries want to make a big display of strength and it is this element of terror that occupies much of the book. Leon comes to find that there are no real absolutes in life and that he doubts all the certainties of his revolutionary parents and colleagues. It’s only by distancing yourself from your target that you can really carry out a successful, dramatic assassination – if you are too close to your object it becomes impossible. As we know, the fortunes of those involved in revolutionary actions rise and fall, ebb and flow, and the life of Leon M. is no different. His past is gradually revealed as the novella goes on; from small-time rebel to powerful commissar to ousted official, nothing was certain in the early 20th century. Nemirovsky is clever enough to draw discreet parallels between the rise and fall of Courilof’s career and that of Leon M., as if to say that whatever your creed or belief, the vagaries and shifts of control of power will allow you no rest. 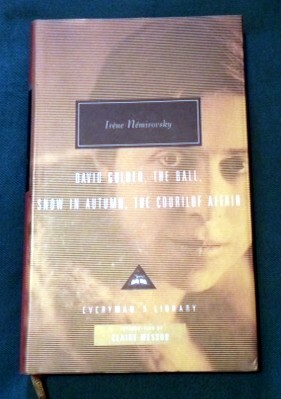 Nemirovsky was a fine writer, and I very much enjoyed this novella which took me outside of the world she normally writers of, and instead into something more like that in Joseph Conrad’s “The Secret Agent”. I’m so glad I decided to pick this volume up in the Samaritan’s Book Cave – my discovery of Irene Nemirovsky’s work has been a joy!